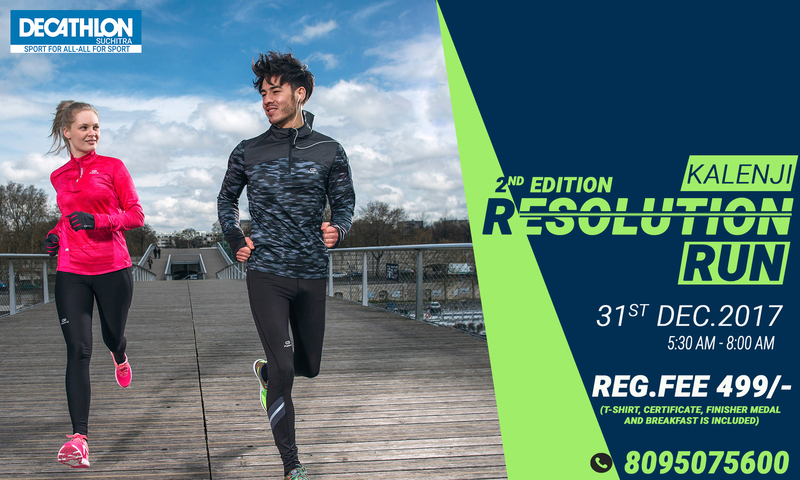 Join Decathlon Suchitra on Sunday, 31st December 2017, and participate in the “ Resolution 10K Run" 2nd edition. The event is open to all, to extend our belief in SPORTS FOR ALL/ ALL FOR SPORTS. Conquer the obstacle and reach the finish line. Note - Particpant cannot transfer or cancel his/her ticket. Decathlon is a French sports equipment company founded in 1976 selling sports products in more than 700 stores in 18 countries around the world. Decathlon Suchitra situated Beside Sarojini Gardens, Pet-Basheerbad, Quthbullapur Mandal, Ranga Reddy District, Kompally, Hyderabad, Telangana 500067, is the third store in Hyderabad, taking a step towards making the pleasure and benefits of sports accessible to all. Our store provides products for more than 40 sports with an extensive range of more than 4,000 products addressing the needs of beginners, intermediate and professional sportsperson. Experience the joy of sports by trying out any of our products within our store and our playground.